Lightning rod energy harvesting solutions? I’ve made a lightning rod, but I can’t think of an elegant way to drain its internal storage. The battery boxes and crystal chargers exist, but not lasers or batteries, so I am limited to EV batteries or IV lasers. Assuming I go with lasers, I need 32 of them, and 8 transformers to power them from the LuV output of the lightning rod. The batteries require even more transformers since their tier is lower. Is there a better solution at this time? At this time right now? No, but I consider adding more high Tier Stuff later so that should fix this Issue when time comes. So I went for the transformers because storing energy in LU means efficiency < 25 % if you intend to use it as EU. I calculated the losses per tick based on amperage and cable length and quality. It adds up to 988 EU/t, which is around 0.188 % of the total 524288 EU/t. However, I get 527400960 EU out of 589824000 EU per lightning strike, meaning there is a loss of 10.583 %. What am I missing? You dont seem to be missing anything. Loss happens, nothing is really lossless. Where is the energy lost though? Based on the wiki articles I should be getting nearly all the EU. Does the EU in the storage of the lightning rod disappear with time even if I am getting all 16 amps out? I cant say much without knowing the exact Setup that you use, so maybe you get loss fro msomewhere else too? 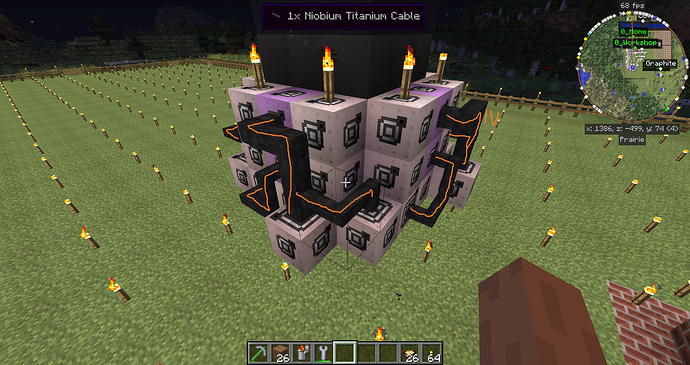 I have 8 IV-LuV transformers connected to the lightning rod output with niobium-titanium wire. Then I have 32 EV-IV transformers mostly adjacent to the IV-LuV transformers. There’s 4 on each IV-LuV transformer. Then I collect all 128 amps of EV with tungsten wire and feed it to a large EV battery box. Each IV-LuV transformer takes 2 amps of 32 kEU from the lightning rod output and outputs 4 amps of 16 kEU - one to each EV-IV transformer, which outputs 4 amps of 4 kEU. The first picture is my current setup and the second one is the older beta. The only difference is the positioning of some tungsten wire and a few EV-IV transformers. To clarify, so I don’t cause confusion: most of the tungsten wire is in the corners on the inside now as opposed to the second picture. I wonder if the issue is that transformers take two amps whenever there isn’t enough Power, so that something might overflow for a second at the Battery Box. Maybe try using two Battery Boxes with the appropriate amount of 32 Batteries. That might work. Can it overflow? Aren’t transformers limited to output at most 4 amps? Do you mean the size of the packets? That would mean that the transformer’s max packet size would be crossed. I don’t know exactly how transformers work as I didn’t go digging in the source, but you got me thinking. Are you saying that a transformer might get two amps instead of one because of the lossy cables? That way the other three transformers only get two packets instead of three due to the 4 amp limit of the LuV-IV transformers. Of course, the two packets that go to one transformer would have to be of different sizes. Consequentally, the IV-LuV transformers would average less than 2 amps on their LuV side. The same goes for the IV-LuV transformers and the lightning rod output. However, I feel like this would lead to much more than a 10% loss. The Transformers do a flat x4 or /4 on whatever is inside of them. But if it accepts 2 Amps (to make up for the loss) it will emit a packet about twice the size that might end up overflowing your battery Boxes. But how can it accept two amps if one amp maxes out its buffer? The IV-LuV transformers accept 16k - 64k and output 4k - 16k. The EV-IV transformers take 4k-16k and output 1k - 4k. The internal buffer is the maximum allowed input packet size (64k and 16k). The way I designed the setup is so that each IV-LuV transformer takes 2 amps of 32k, which max out its internal buffer every tick. Therefore it attempts to output 4 amps of 16k every tick. That means one packet maxes out the EV-IV tier transformer. It can’t handle two amps. oh if that is the case, then its already doubled up like I suspected, yeah try two 16x Battery Boxes, that will likely work. I tried what you said and it worked. I don’t see what the problem was in the first place though, could you explain more thoroughly? I planned the setup so that the transformers would take 2 amps, how can anything overflow? Not to mention that the maximum output of the lightning rod is 16 amps @ 32k EU = 512k EU/t, whereas 16 EV batteries in a batbox can accept 16x16x4k EU/t = 1024k EU/t. 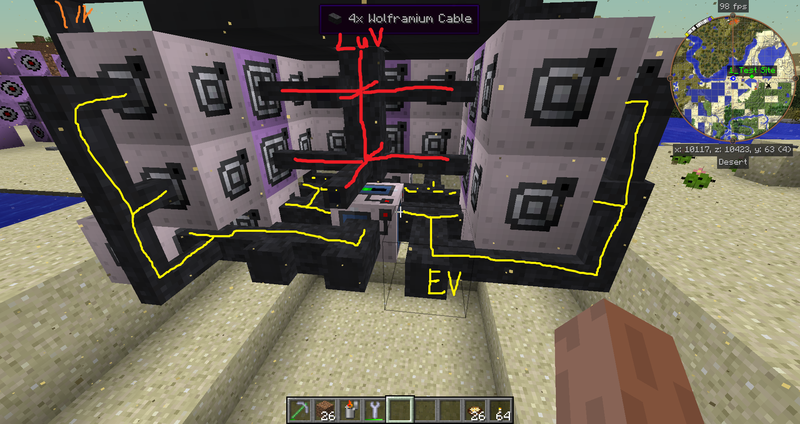 And the 4 cables leading to the battery box support at most 32 amps each at 6144 EU, meaning 786k EU/t. The cables would melt before the input could overflow. the Transformers aren’t the Issue, its the Battery Boxes that have the input limitation that wastes part of your power. So more Batteries = Less Limitation. Why is that limitation less than the wiki says though? that’s the thing its not. when you’re going with average energy it should all be fine but it alternates between high and low every tick, and that makes you have to use two batboxes.